President Donald Trump is set to meet Nato leaders for potentially fractious talks at a summit in Brussels on Wednesday. Ahead of his visit, Mr Trump hit out at the EU on trade and at his Nato allies for failing to spend enough on defence. He was met with a sharp rebuke from European Council President Donald Tusk, who accused the president of criticising Europe “almost daily”. Mr Tusk added that the EU spent more than Russia on defence, and as much as China. He said the US did not and would not have a better ally than the EU, reminding the president that it was European troops who had fought and died in Afghanistan after the 11 September 2001 attacks on the US. For his part, President Trump predicted that the Nato meeting could be harder than his summit with the Russian leader Vladimir Putin in Finland next Monday. President Trump has claimed the US is being “taken advantage of” by other members of the Nato alliance, which was set up in 1949 to counter the Soviet Union. His main objection is that a number of member states have not increased their defence budgets to meet a 2014 goal. 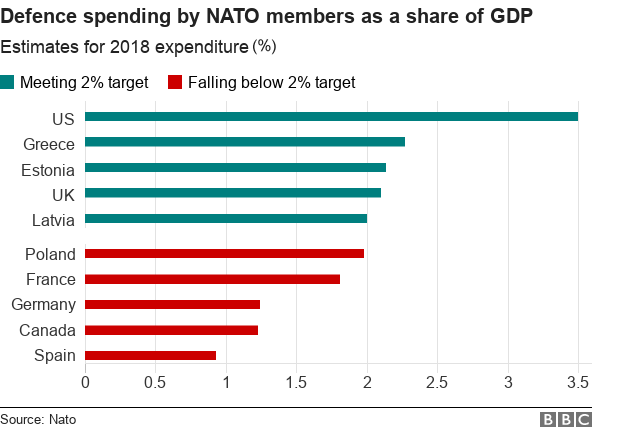 Nato figures released on Tuesday showed the extent of the shortfall, with 24 of Nato’s 29 members forecast to fall below the alliance’s target of spending 2% of GDP on defence in 2018. Can Nato survive Donald Trump? What does the US contribute to Nato? The US currently spends more than 3.5% of its GDP on defence. Among European members, Greece, the UK and Estonia spend over 2%. 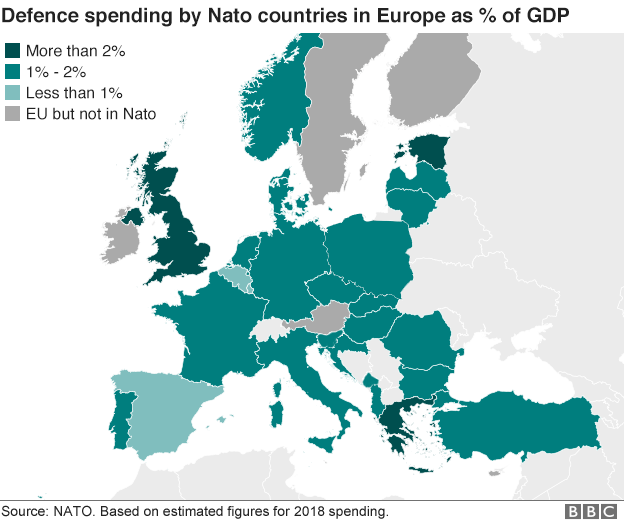 Washington pays about 22% of Nato’s running costs – but European officials say just 15% of America’s overall defence spending happens in Europe on Nato business. Why are Nato countries worried? Previous US presidents have also urged greater defence spending from European nations. However, some in Nato fear Mr Trump’s repeated blunt demands could harm morale, furthering the agenda of Russia’s President Putin whom they accuse of seeking to destabilise the West. Some have expressed fears for the future of Nato itself, and German Chancellor Angela Merkel has indicated that Europe may no longer be able to rely on its US ally. Despite that, US officials told Reuters the president is expected to reaffirm US support for Article 5 of the Nato treaty, which states that an attack against one ally is considered an attack on all members. After the Nato summit on Wednesday, President Trump will spend four days in the UK before his summit with the Russian leader on Monday. While Mr Trump is looking to improve relations with Russia, there has been alarm at the deteriorating climate with his allies in Europe and what he might agree to with President Putin. Mr Trump is a difficult guest: he’s tweeted his meeting with Putin might be easier than those with Europeans. And the US president made it clear he wants Europeans to do more for Nato and for their collective security. Some of his supporters in Washington – the nationalists – think the US should drastically reduce its Nato contributions. Privately some European diplomats have been shouting – well, raising their voices – at me in back hallways because of their anger over Trump. Others in Europe – like Tusk – are tweeting. Still they’re trying, mostly, to be hospitable this week. And President Trump’s told reporters that in the end he thinks everything will fine. “All countries will be happy,” he said, unconvincingly. What’s the Nato row got to do with the EU? Mr Trump has linked the issue of US military spending to the EU’s trade surplus with the US, complaining that the bloc “makes it impossible for our farmers and workers and companies to do business in Europe” and then “want us to happily defend them through Nato”. The EU is America’s biggest export market, taking $501bn in goods and services in 2016, the latest year recorded by the Office of the US Trade Representative. The trade office’s figures say US imports from the EU rang in at $592bn- leaving a $91bn goods and services trade deficit. Last month, the US raised fears of a trade war by slapping tariffs on steel and aluminium from the EU, Canada, Mexico and other US allies. The EU hit back with tariffs on products including motorcycles and orange juice.